Dr. Md. Sabur Khan, Chairman, Board of Trustees, Daffodil International University hands over a memento to Prof Yang Jiaqing, Dean of Huanyu Residential College in SIAS University at the closing ceremony of “DIU Winter Camp-2019” held at Daffodil International University. Closing Ceremony of ‘DIU Winter Camp-2019’ of Daffodil International University (DIU) was held today at 71 Milonayoton of the university. 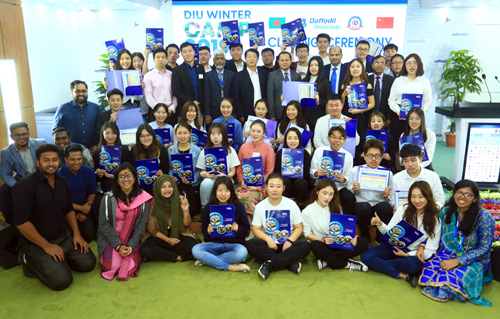 A contingent of 35 students & 4 High Official in total 39 participants from SIAS International University China which is a dearest & active partner university of DIU joined the Winter Camp at Daffodil International University Bangladesh started from 16 January until 21 January 2019. Dr. Md. Sabur Khan, Chairman, Board of Trustees, Daffodil International University was present as the chief guest. Prof Dr Yousuf Mahbubul Islam, Vice Chancellor of Daffodil International University and Prof Yang Jiaqing, Dean of Huanyu Residential College in SIAS University were present as the special guests Prof Dr. Md. Fokhray Hossain, Director of International Affairs of Daffodil International University presided over the program. The participants of the DIU Winter Camp shared their week long experience gathered at Daffodil International University at the program. .
Dr. Md. 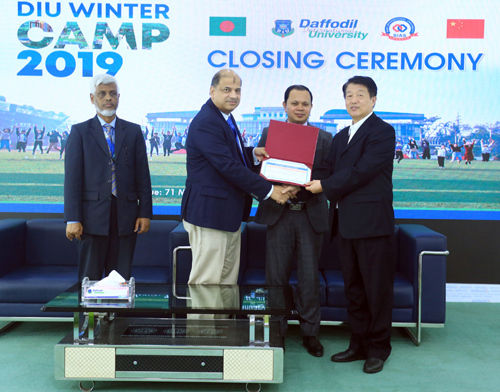 Sabur Khan, Chairman, Board of Trustees, Prof Dr Yousuf Mahbubul Islam, Vice Chancellor of Daffodil International University and Prof Yang Jiaqing, Dean of Huanyu Residential College in SIAS University along with participants of ‘DIU Winter Camp-2019’ pose for a photograph at the closing ceremony of the camp. Throughout the week, the team had different cross cultural learning experiences about Bangladesh along with few effective sessions. Such as, the team practiced Bangali Folk Pottery Art, a session about Bangla language & culture, visited National memorial, Museum, University areas, local markets, engaged in community visits, gathered knowledge of social entrepreneurship and so on. At the end of the program Dr. Md. Sabur Khan, Chairman Daffodil International University handed over the Certificates among the participants.